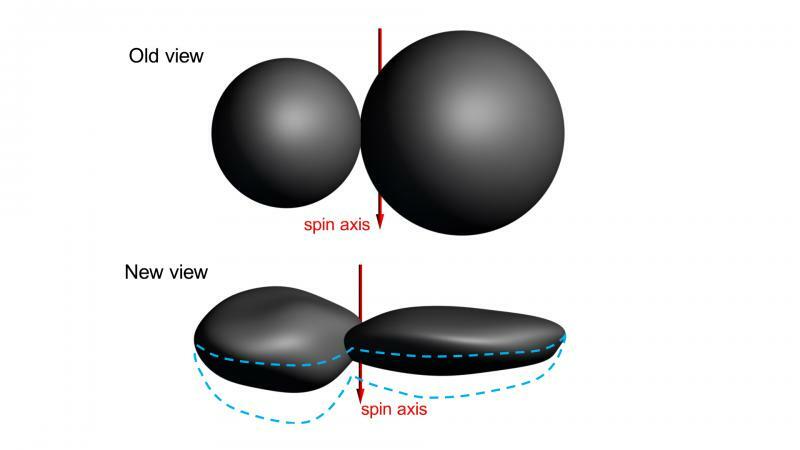 Sorry, there was a link somewhere to article explaining that UT has helped scientists figure out planetary development thought the fusion of the two bodies. I can't seem to locate it. Does that ring a bell with anyone? There's this space.com note that considers "pebble accretion" as a planetary body former. The new photo looks like the death star with an attached barn/garage. That's quite a crater on the small piece! Rotate the image 90 degrees clockwise and I see two eyes, a nostril and a mouth... Pareidolia rearing its head again. newolder wrote: There's this space.com note that considers "pebble accretion" as a planetary body former. newolder wrote: Rotate the image 90 degrees clockwise and I see two eyes, a nostril and a mouth... Pareidolia rearing its head again. Indeed. And the circle where a shoulder could be indicates limb amputation? * a snowman is a particular type of rake, a rake is a type of lockpick.